According to Mullins (2010) personality is as ‘an individual’s unique set of characteristics and tendencies which shape a sense of self, and what that person does and the behaviour they exhibit’. There are various theories, debates and approaches to personality. One of them is centred on whether personality is inherited (nature debate) or developed in response to environmental conditions (nurture debate). Some approaches argue for the mix of both genetic end environmental influences. Some people believe that personality applies to more than one person, that it is determined only by environmental factors. But after studying the issue we can notice that personalities are not the same. For instance if we will take into account twins, children which are born on the same day, and who are brought up in the same environment, show diverse and different behaviour and traits. As a matter of fact there is also contrast between personalities of siblings, who were born to the same parents and grown up in the same environment but still depict inimitable personalities, which vary not only from each other but also from the parents. It is fairly difficult to assess which factors outweigh personality if it is whether nature or nurture influences. In my opinion nurture is the dominant influence, because I feel like all individuals are unique and they are susceptible to the changes in their behaviour caused by situations in life (environmental circumstances). Personality studies may be divided into two main approaches: nomothetic and idiographic. Nomothetic approaches tend to view social and environmental approaches as a minimal and view personality as resistant to change, consistent and inherited. It is claimed that it is possible to predict the ways in which personality types would behave given certain circumstances. This approach transfers methods used in natural sciences to the social world. On the other side idiographic approach require going beyond the study of pure psychology to and understanding of societal context in which the person lives. It is connected with understanding motivation, career development and team relationships. Personality development is believed as a process that is open to change. Individuals respond to the environment and people around them, the dynamic of the interaction is seen as a critical part in shaping personality. I scored low for the Openness which is sometimes known as ‘Openness to experience’. Low score means that I tend to have a less broad range of interest and I usually stick to what I know rather than being overly enthusiastic about trying new things. It means I have got traditional and realistic way of thinking and because of that people sometimes can view me as a conventional person. People with low-to-medium Openness may therefore be less likely to believe in things like conspiracy theories. It says I have got narrow range of interest and may find that generating lots of imaginative ideas is not my big strength with which I would totally agree. For Conscientiousness I got high score which means I am rarely distracted, hard-working, self- controlled and good planner. In general conscientiousness describes how dependable, organised and hard-working a person is likely to be. This may be the reason why, of all the personality traits, conscientiousness is the most consistent indicator of job success. People with score like mine tend to be extremely dependable and organised. It is likely that my life is well-planned and my approach things in a thorough manner. At work, I approach tasks methodically and thoroughly, with everything in its right place. Some studies shown the more conscientious an individual is, the more disciplined they are likely to be about exercise and diet. My result for Extroversion is 3.4 out of 5 which means is medium score. Extroversion is characterised by positive emotions and the tendency to seek out pleasure-stimulating or risk-taking activities. People with scores like mine are likely to be comfortable meeting new people and will usually enjoy social occasions. I am likely to have a generally positive outlook on life and may display a greater gift for leadership. 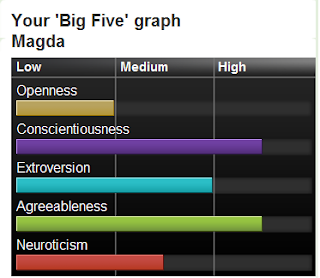 My result for Agreeableness is high; 4 out of 5. Agreeableness measures how sympathetic and considerate a person is likely to be. My high score means that I am likely to find it very easy to get along with other people. I am sensitive to the feelings of others and people find it easy to warm to me. As a ‘people person’ I will be very comfortable in situations that require teamwork. Neuroticism relates to a person’s response to threatening or stressful situations. For this trait my score is medium (2.8 out of 5). I am likely to be comparatively level-headed about perceived threats, but I can find myself worrying when faced with uncertainty or unfamiliar situations. In addition, there is evidence to suggest that neuroticism, when combined with high scores in personality such as conscientiousness, as in my case, can result in a powerful work ethic and will to succeed. Summing up, I believe that each individual is different and has got unique personality structure. There are a lot of debates being published on the various approaches to the personality. Some scientists say that personality type is fixed from the beginning; they do predictions resting on statistical study of groups. The other theorists argue that people are adaptable and they are open to change while interacting with environment. I would rather argue for idiographic approach to personality, however, my results from The Big Five Test turned out to be coherent to the reality, which might signify that personality assessment can be really useful tool for example in recruitment process at work.